Born in Utrecht, The Netherlands in 1927, Woldendorp showed an interest in painting and drawing from an early age, and eventually studied commercial art. Joining the Dutch army at the age of nineteen he was posted to Indonesia. After three years his company was moved out and being young servicemen, were encouraged by the Australian government to apply for immigration and so he decided to emigrate to the warmer climate of Australia in 1951. Although destined for Sydney, he decided to stay in Fremantle for a time, but ended up staying in Western Australia. In 1955 Woldendorp planned a holiday back to Holland and bought his first camera, a folding Voeghtlander 6x9 which was the beginning of his long association with photography. He became fascinated with the camera as a creative tool and consequently joined the Cottesloe Camera Club where members shared knowledge, equipment and inspiration. By 1961 Woldendorp had amassed both the confidence and a sufficient range of photographs to enter and win first and third prize in the Craven-A National Portrait Photographic competition. This recognition gave him the incentive to embark on establishing himself as a freelance photographer, working for magazines, government departments and mining companies. This extensive travel introduced him to the outback and the Australian landscape. Intrigued by the spaciousness, the light and its uniqueness he took to landscape photography, specialising in aerial photography. Over this time Woldendorp has received multiple awards (listed below), has had 38 solo exhibitions - one of these, 'Abstract Earth' was toured throughout WA at 15 venues - and has contributed to many more exhibitions. He is the author of 27 books, publishing many of these himself. “The Australian landscape has always appealed to me. There's something about it - its spaciousness, its character, the light and its uniqueness. But it also is a very old landscape. It is the flattest and driest continent, which compared with other countries, does not manifest itself in grandeur as we know it - large rivers, large mountains and the dramatic changes of the seasons. However, I found that by looking at the landscape from the air, many characteristics revealed themselves much better and form a strong image not visible at ground level. It shows the evolution and the geographical variations. Australia also has large spaciousness, virtually unaffected by man, so it is possible to record millions of years of evolution in total. 2004 W.A. 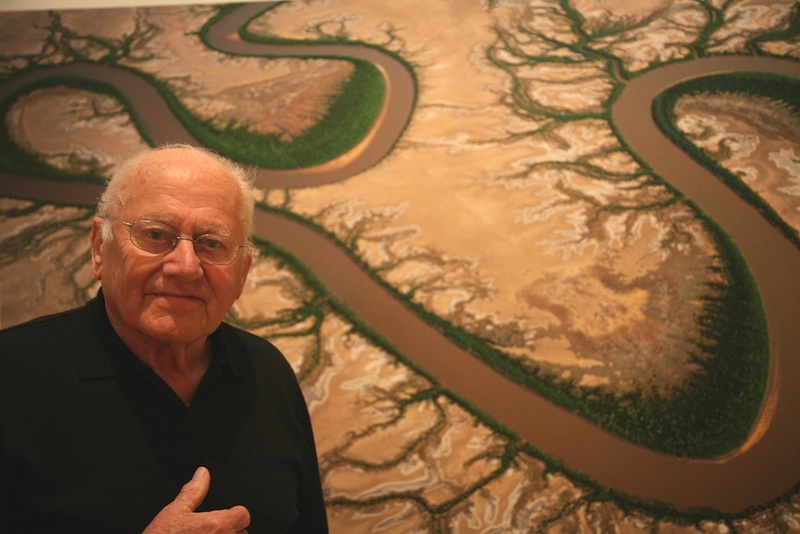 State Living Treasure Award, for his outstanding contribution to the visual arts, his skill, talent and intensity as a photographer and his original and awe-inspiring vision of the Australian landscape. 2009 to present Abstract Earth: Photography by Richard Woldendorp, toured in WA by Art on the Move: Goldfields Arts Cebtre, Kalgoorlie; Artgeo Gallery Busselton; Ellenbrook; Fremantle Prison; Denham; Wanneroo; Geraldton Regional Gallery; Katanning Gallery; WA Museum; Albany; Bunbury Art Gallery; Cannery Arts Centre, Esperence; Mandurah Art Gallery; Lake Grace; Narrogin; Carnarvon Art Gallery.